Manual vs. Automatic Gate: Which is a better driveway gate for you? The first Impressions last. And nothing makes a better impression for you and your home than welcoming guests to your property with a stylish gate for them to pass through. A driveway gate not only dramatically enhances the curb appeal of a home; it also saves homeowners from unwanted visitors, trespassers, or solicitors that uninvitingly show up at their doorstep. Before you buy a driveway gate, start with considering which gate system would work well for you: manual or automatic gate? The difference is usually just a matter of convenience. But to help you arrive to a more informed decision, here’s what you need to know about manual and automatic gates in terms of style, security, budget, and materials. Manual gates are operated by hand. For security reasons, they come with locks to be manually latched and unlatched by a person. Manual gates come with plenty of styles – whether you prefer a modest aluminum slat fencing or more fashionable entrance, manual gates can come in various designs and can even be customized according to your liking. 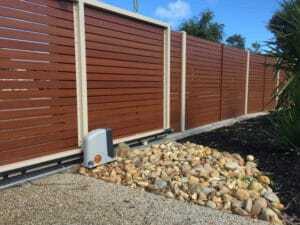 Moreover, manual gates are cheaper and easier to maintain than automatic gates. And unlike the latter, manual gates don’t depend on power – meaning you don’t have to worry about getting in or out of your property when electricity is out. Automatic gates are operated by motor. Clearly, the main advantage of an automatic gate over manual is convenience. Automatic gates save homeowners from the inconvenience of getting out of the car to open the gates, each time they leave or return to their home. But aside from that, automatic gates also reduce the risk of house being mugged by robbers who can pick locks. Swing – gates that swing open and close simply like your bedroom or bathroom door. Sliding – the most common type of automatic gate. They slide left either from left to right, or right to left, to open or close the gate. Bi-Folding – these are the gates that fold and unfold itself to allow access. Vertical Lift – these are the ones where the entry gate moves and up and down vertically. Vertical Pivot Lift – gate openings that rotate in and out. For your manual or automatic gates need, Accolade® Weather Screens is willing to offer a free and no-obligation quotes and measures for you! I love how you said that an automatic gate allows you to activate it without having to leave your vehicle. My husband and I want to still a fence around our house and have a gate in the front to protect us while still allowing us to get out. We don’t want to have to get out and open and close it every time we leave though. Perhaps a sliding gate that is automatic would be a good choice for us. I agree, a gate really adds to a home. Not only the aesthetic, but the extra peace of mind is vital. I like the idea of a manual gate not only for the cost effectiveness, but because you can always count on being able to work it yourself. No wasting time trying to fix something you don’t know how to fix, when a manual gate needs repairs they’ll be simple and easy, not a problem at all. Great! Thanks for sharing this blog. You explain the Manual vs. Automatic Gate very well. Keep Posting!